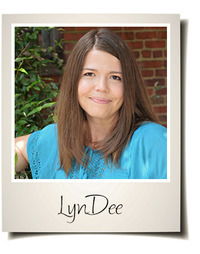 Welcome, LynDee! Tell me about Front Page Fatality...what was the inspiration for the book? I missed writing, and I missed the newsroom. So my brain, in the efficient way that brains can, made up and presented me with a reporter heroine, in quite a bad situation. I tried for a few days to ignore the idea, and when it didn't go away I started writing. Eventually, that book became Front Page Fatality. I'm thrilled that Nichelle's story is going to be a series, because I love her and her world, and I have many more of her stories to tell. Oh, there's more than a little of me in Nichelle. I was an only daughter of a single mom, and we were ridiculously close. I still miss her every day. I always wanted to work at the Washington Post, until I met my prince charming and decided I couldn't leave him behind (it worked out well for me, though. We've been married for twelve years and I have a wonderful, blessed life). I also tried to be courteous when dealing with sad situations as a working reporter, and I had some great sources I'm glad to call friends many years after I left the business. Nichelle can run in her awesome shoes, though, when I can barely walk in them, and she's way better with snappy comebacks than I am. Always. Ever since I can remember, I wanted to be some kind of writer. I adored the news business, but reporters work crazy (and long) hours. It wasn't a good fit for me when I became a mom. I have always loved books, though I never thought I could write one until I finished Front Page Fatality. Being an author is more than a dream come true for me. It's a dream I didn't even dare to have for a long time come true. And that's amazing. Do you have pets at home? Did they inspire Darcy the Pomeranian? I do! I have a toy pomeranian dog who is remarkably like Darcy, in fact. She's a great dog. And I'm not biased—every time I leave her with anyone, they ask if they can keep her when I get home. She was my baby before I had children, and she's been great with every non-fur baby. Though she did look at me like "Really? Another one of these things? Is it going to pull my hair, too?" when I brought the younger two home. I wrangle children, read, cook, try to work out ... and every once in a while I clean. When I have to. Scarlett O'Hara, though I think she was hopelessly stupid about men. V.I. Warshawski, Jaine Austen, Nancy Drew, Hermione Granger, Miss Marple ... I could go on for pages. I love smart, strong women who can laugh at themselves. I'm in edits on Nichelle's second mystery, BURIED LEADS, which will be out October 15, and writing a novella for a Christmas anthology with works from Terri L. Austin and Larissa Reinhart, which goes on sale in early December. 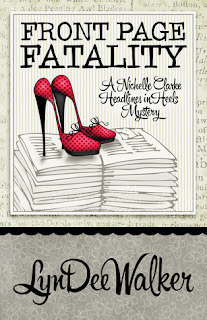 Enter to win a $20 Amazon.com gift card here or via the Cozy Mystery Book Tour website. Enjoyed your interview. Your book sounds really good. Hey Sue! Thanks so much for stopping by. I hope you enjoy the book!